The mission of the Tall Pine Safety Resource Center is to provide quality, comprehensive injury prevention educational services for Maine residents. We will accomplish our mission by forming partnerships with local, state and federal agencies who share the common vision of preventing unintentional injuries. Bob Bull was a leader in injury prevention in Maine. He founded Safe Kids Maine in 1988 and led the coalition for 12 years, visiting thousands of school children to promote safety. Bob was affectionately referred to as 'Tall Pine' by the children whom he spoke with. Bob passed away in 2008. The Tall Pine Safety Resource Center is respectfully named after Bob as a tribute to his long standing commitment and dedication to preventing unintentional injuries. Our goal is to carry on Bob's compassion and spirit of helping others in need. 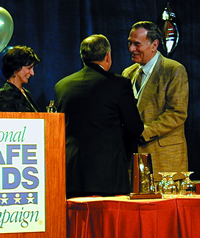 Bob Bull, accepting the Lifetime Achievement Award at the Safe Kids Leadership Conference in Washington, DC in 2001. In 1982, my son Robbie, then 2 years old, pushed a stool up to the kitchen stove and pulled a pot of boiling water onto his body. His recovery took many months, and I spent much of that time at the Shriner’s Burn Hospital in Boston witnessing the pain that Robbie and the young children endured. I knew I had to do something to stop this from happening to other children. Seven years later, after years of independent injury prevention efforts, I founded Maine’s statewide SAFE KIDS coalition, which I have coordinated out of my barn in Temple, Maine, for the last 12 years. Having worked intimately with SAFE KIDS for so many years, I can say that it is much bigger than the national office in Washington, D.C. It’s even bigger than its more than 300 coalitions. SAFE KIDS is a groundswell of awareness and support for child injury prevention that finds tens of thousands of busy parents, grandparents and others helping to execute local safety projects. SAFE KIDS has become a remarkable lifesaving movement. Some of the inspiration is borne of success -- the 33 percent reduction in fatal injuries during our first decade. Supporters and helpers are motivated not so much by the numbers themselves, though, as by their translation into specific lives staved, like the two entire Maine families saved by SAFE KIDS-provided carbon monoxide alarms, and the seven youngsters welcomed into Maine’s Saved-By-My-Helmet Club just last year. The challenge now is to keep the spirit alive. The next 33 percent reduction in injuries will be much harder to achieve. This means that we must make our coalitions more stable, with longer term financial support. It means igniting the SAFE KIDS spirit in every single member of our coalitions. It means our efforts must be multiplied by working with and through many other organizations. The more Champions of SAFE KIDS we have aboard, the greater the effectiveness of our noble mission. The spirit of SAFE KIDS, only a spark a decade ago, is now a contagious commitment to the safety and well-being of children. Keep it glowing. Robert Bull, known as Bob to his friends at Safe Kids Worldwide, died last Tuesday, Feb. 26, 2008, following a sudden illness. He was 76. Bull was the longtime coordinator of the Safe Kids Maine Coalition, one of the original coordinators from the former National SAFE KIDS Campaign. He received a lifetime achievement award from the campaign in 2001 for his many years of service and dedication to preventing accidental injuries to children. In accepting his lifetime achievement award, Bull explained that his involvement in child injury prevention stemmed from a kitchen accident involving his then 2-year-old son Robbie. The toddler pushed a stool up to the stove and pulled a pot of boiling water onto himself, requiring many months of recovery from his burns. “I knew I had to do something to stop this from happening to other children,” Bull wrote, and proceeded to found the Maine statewide coalition, which he ran out of his barn for 12 years. Safe Kids Worldwide Public Policy Director Alan Korn remembers Bull’s extraordinary efforts. "Bob was one of those rare individuals who spent his entire professional life caring for others,” Korn said. “I am most certain that his commitment and love for Maine's children saved lives and prevented horrific injuries. We will all miss him dearly." Bull’s lifelong commitment to helping others most recently found an outlet in the Seed Missionary/Humanitarian Project, which provides seeds and growing instructions to farmers in South Africa. Robert Logan Bull of Temple, Maine died on Tuesday, February 26, 2008. A memorial service is scheduled for Saturday March 8 at 1 PM at the Fairbanks Union Church, the chapel will be open from 12 noon for quiet reflection and prayer, and will be followed by a community dinner and celebration of his life. He will be buried in the Spring in a family cemetery near his home on Santa Claus Lake, where he lived since 1970. Mr. Bull was born in Pennsylvania on June 17, 1931, the son of Fred Logan Bull and Laura Amos Bull, both of Maryland. He is survived by son Stephen R. Bull and daughter-in-law Leslie L. Bull, grandson Spencer Bull and his wife, Amanda, all of Temple; grandson Michael Williamson and his wife, Monica, of Arkansas; son Fred S. Bull and grandchildren Tyler, Zachary, and Allie Bull, all of Pennsylvania; son Robert A. Bull and daughter Laura J. Bull of Connecticut; sister Dorothy B. O’Donnell and brother-in-law Edward P. O’Donnell of Maryland; and close companion and friend Karen Clary of Farmington. The deceased was educated at Deep Springs College, California, Cornell University, and the University of Delaware, where he devoted the first half of his career to teaching marketing and interdisciplinary courses as a professor and department chairperson. For the second half of his career, he headed his own consulting organization, based in Temple, serving clients worldwide – including Binney and Smith (Crayola), and Johnson & Johnson. He authored over 700 manuals, books, and magazine and journal articles on food, marketing, health care, and child safety, plus several hundred newsletters on the same subjects. Robert Bull was well known to school children throughout Maine for his programs as “Tall Pine,” educating youth about our American Indian cultural heritage. He presented hundreds of programs on safety as founder of the Maine Coalition for Safe Kids. He served for many years as a trustee of the Pine Tree State 4-H Foundation, on the Board of the Maine Congress of PTAs, and on the Board of the Safe Kids organization. He was the recipient of many awards and citations that include the Lindback Foundation Award for Teaching Excellence, the National Small Business Advocate-of-the-Year Award of the Small Business Administration, Maine’s Jefferson Award for community service, the first Lifetime Achievement Award of the National Safe Kids Campaign, and several comparable citations from national food trade organizations. He also was awarded honorary lifetime membership in such diverse organizations as the Produce Marketing Association, the Turkish orphanage society, and the Mushroom Growers Association of England for his contributions assisting their constituents. In recent years, one of his most-gratifying efforts was providing vegetable seeds to impoverished African villages, and learning how that project changed lives. His avocational interests centered on gardening, American Indian history, promoting childhood injury prevention, orphanages, writing family history, raising exotic poultry, and nature studies. In accordance with his funeral instructions, he requested no flowers or charitable donations in his name. Instead, persons inclined toward such kind acts are asked to do something special to benefit a child in need.